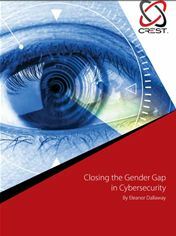 1 September 2016: CREST, the not-for-profit accreditation and certification body representing the technical information security industry, has released a report outlining the details and conclusions from its 2016 Diversity Workshop, attended by representatives from CREST member companies and a variety of leading professionals, from industry, government and academia. It is no secret that the cyber security industry suffers from a lack of gender diversity and it is estimated that only 10% of the global information security workforce are women. The industry has begun actively addressing the issue, with major industry players coming together to discuss the main obstacles to gender diversity and, more importantly, what is needed to resolve them. The CREST report looks at why diversity is an increasingly important issue, what is deterring women entering the industry, how to make a difference, who to target and how to get the message out to there. CREST is the not-for-profit accreditation body representing the technical information security industry. CREST provides internationally recognised accreditation for organisations and individuals providing penetration testing, cyber incident response and threat intelligence services. All CREST Member Companies undergo regular and stringent assessment; while CREST qualified individuals have to pass rigorous examinations to demonstrate knowledge, skill and competence. CREST is governed by an elected Executive of experienced security professionals who also promote and develop awareness, ethics and standards within the cyber security market.